The scene at the Western Distributor Road yesterday. 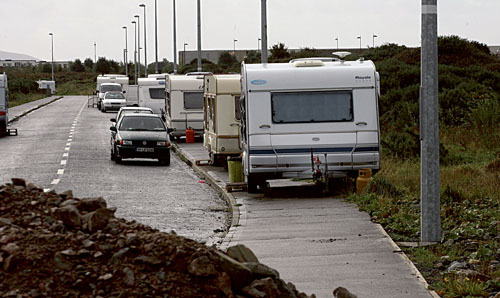 Growing tensions between Travellers and Gort na Gréine residents can only be solved if the road the Travellers are encamped on is taken in charge by the Galway City Council, according to Cllr Donal Lyons. On Monday evening, a group of Travellers encamped at the link road between the roundabout at Miller’s Lane and the Rahoon Road. According to Knocknacarra Cllr Donal Lyons, some 15 caravans moved into the site around 7.30pm that evening. Residents in the adjacent Gort na Gréine estate complained there was a lot of noise being made, disturbances, and the sound of loud generators going all night. The Travellers had originally been living at a halting site in Ballybane before moving to the hard shoulder on the Bushy Park to Moycullen road. They had been located there for five months before being evicted and relocating to the area near the Western Distributor Road. The road where they have settled is a private road which has not yet been taken in charge by the Galway City Council. The management company is looking after the road on behalf of the Moritz Group which is behind the development of the major shopping centre in the area which includes Dunnes and B&Q. He said the location is not good for the Travellers either as there are “no facilities, no toilets and no running water on the site”. Gort na Gréine residents contacted Cllr Lyons who in turn brought the matter to the attention of the city council. He was informed that the matter was “out of the council’s hands” as it had no authority over the road as yet as it was still in the care of the management company. He is now calling on City Hall and the management company to sort out the status of the road and to rectify the situation.